Herein are a couple of photos taken by Robert Albert back in October of 2015. These two cars are displayed with the old (1880) Toledo St. Louis & Western (Cloverleaf) Maumee depot. The caboose is identified as Nickel Plate Road but in reality it is former Chesapeake & Ohio #90695, sold to the Toledo Terminal in 1953 and numbered as TT 170. The boxcar is also identified as Nickel Plate, but that apparently isn't the case. The first photo shows what appears to be a normal 40' single door steel boxcar, but the second photo shows a rather unusual end. Anyone have any idea as to the heritage of this boxcar? Any info appreciated. The whole construction of the boxcar is unusual... all welded, with that strange roof eave treatment. It's obviously been rebuilt from an older car. I would suspect AC&Y, only in that I'm familiar with some other cars they rebuilt, and similar flat panel and welded roof construction was used. Circumstantial evidence: The AC&Y was affiliated with the Norfolk & Western, which owned all the track in Maumee after 1964. Not sure if I typed everything correctly, but the car has the letters OERM 4 on it. In their equipment roster, it is listed as being circa 1925 with the note C&NW? The end of the car looks remarkably like the boxcar in Maumee. The trucks appear to be the same. Same "roof eave treatment" as noted by Dennis. Do the cars have the same origin/history? The little mystery grows! The trucks may have the owners raised initials cast on the top of the truck frame. Yes. And if the owners raised initials for both the car in Maumee and the one in Perris were the same, that would almost surely give us the original railroad. However, I am nowhere near either Ohio or California to make a check of the trucks. With all due respect to Mr. Storzek, I would be very surprised if this was ever an AC&Y car, but I can't offer another suggestion. I suggest looking closely at the trucks for cast-in data, although it is possible that they are replacements. I've been suspiscious about this boxcar design. 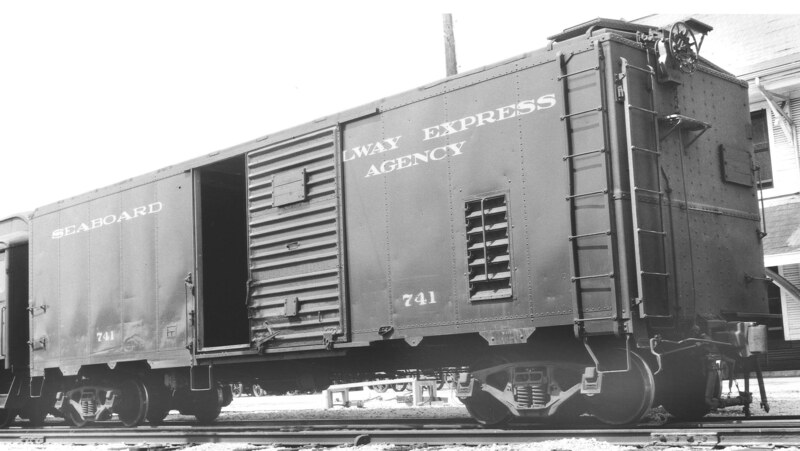 This is an REA boxcar, note the end plate that may hold an information pack. But it has these frames on the end that suggests me that it may have been a former passenger pass thru door converted. Not quite the same as our mystery car. . .
One thing I did find looking for this SAL car was that it is a variation of the 1932 AAR-ARA car. Frame construction looks different, in particular the end sills. I can't help but wonder if the "mystery" cars are rebuilds of wooden cars. That the two cars in Ohio and California look so similar says both are from the same road. . .but which one is it? Another photo of OERM 4 has the old lettering showing up more clearly--United States Army. If it's a rebuild of a wooden car (and I can't help but think it is), its odd appearance--not looking like anything we would normally see on a railroad--would suggest something the Army would do. What was said of the Army--there was the wrong way, the right way, and the Army way? 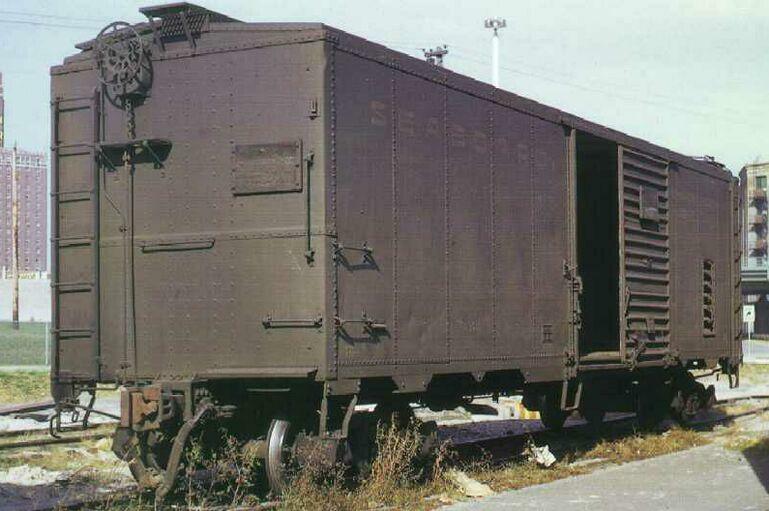 I agree that the photo of the old Seaboard box car that dinwitty submitted is an entirely different car from the ones at Maumee, Ohio and Perris, California. Thanks for photo showing the United States Army lettering on the side of the Perris car at OERM. If we actually think that the car was a wood car that was rebuilt with steel sides, the question is whether the Army would have done it, or whether some railroad updated some older wood cars and the Army later purchased them when they became surplus on that railroad. Again, the lettering on the trucks may help solve that question. Was the Army known for rebuilding wood railroad equipment? I have been staring down a bunch of sources, there are no obvious matches, it is not any standard car out there that matches for now. It seems like it is a modded REA car that had end doors for passenger train use that had diaphrams removed. It was likely around during WW2, perhaps some line needed a car and the war restrictions limited them so they grabbed this car and modded it. Thats my direction to test/check. The roof design is what cued me, not a wagontop, not any standard box, flat end, and its got these vertical frames on the end that should be doing something or used to. The prominent end posts aren't that unusual, and don't necessarily indicate an end door. Back in the pre-WWI era, before the advent of pressed steel ends, ALL boxcars had end posts, some cars had four, others only two. The end sill protruding beyond the end is another design feature that was gone by WWI. What is particularly jarring is seeing these features on a welded car; welded construction didn't come into its own until after WWII. Which leads me to believe that these cars are the result of covering the steel frame of a much older car with steel sheet, and it looks "home made." For a while between the wars, the Youngstown Steel Door Company marketed prefabricated steel sides for rebuilding older cars, but those sides were riveted, and the resulting cars made use of all the latest pressed steel ends and roofs. These cars are just weird, the result of someone trying to improve their car fleet one at a time in their own shop. The question is, who? Did some additional searching on the internet and found some additional info. First, there was discussion about a OERM GE diesel on the Train Orders website and there was a photo of the said diesel switching one of these cars. A comment was made stating the following about the TWO cars at OERM. They were located at Desser Tire & Rubber in L.A. described as "entombed" in piles of tires for 30 plus years. "Obviously military but have C&NW cast in the trucks"! The cars were moved on their own wheels to the museum along with some other equipment from Desser. The date of this Train Orders discussion was October 2008; no info as to WHEN the cars were moved. I then looked for some additional OERM photos and found one with one of the cars with Desser Tire & Rubber painted on the right side. It is either the SECOND car or the OTHER side of OERM 4. I was able to enlarge parts of that photo and it shows a RPKD date of 12-12-93, probably just added for the move from L.A. to Orange Empire. So, if the cars were moved in 1993 and had been at Desser for at least 30 years, they would have had to be sold to them in 1963 or earlier. BTW, there is a spot for the BLT date, but it is blank. RATS! I wish I could post that photo of the car with the Desser Tire & Rubber lettering, but haven't been able to figure out how to do it. If anyone can locate the photo and post it, it would be great. One other very interesting thing in that photo of the one end of that car at Perris is that, just under the now fading Desser Tire & Rubber lettering, is a somewhat circular herald. Can't quite make it out, which is another aggravation! So now we know that the C&NW MIGHT have been the railroad that rebuilt some old wooden boxcars with these welded steel sides, but it is still possible that the trucks might have been added later. If C&NW also appeared on the trucks of the Maumee car, it might cement the fact that it was the Chicago and North Western that did the rebuilding. Was there such a program (maybe during the Depression) to so rebuild old cars? Anyone from the C&NWHS out there who could chime in?